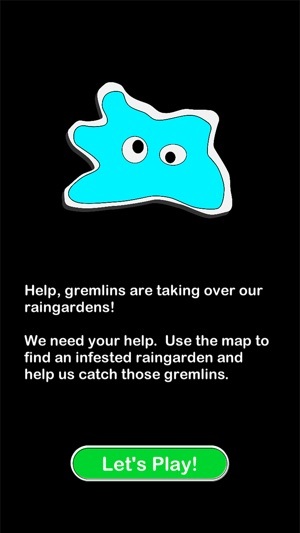 Help, gremlins are taking over our raingardens! Inspector Green uses GPS and augmented reality to train players to spot and eliminate raingarden maintenance issues. Introduce learners to stormwater management, raingardens and raingarden maintenance. Use this app as an icebreaker at the beginning of your raingarden maintenance training program to get everybody outside, developing a familiarity with common raingarden maintenance issues. 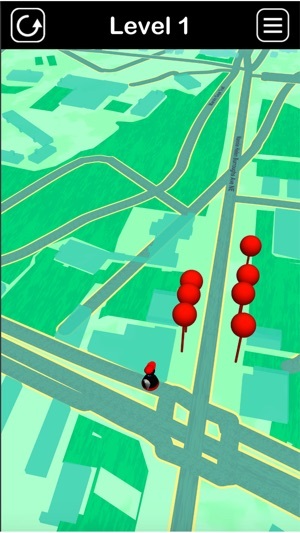 Inspector Green uses GPS to track a player’s location relative to nearby game locations. When you get to a game marker, tap it. 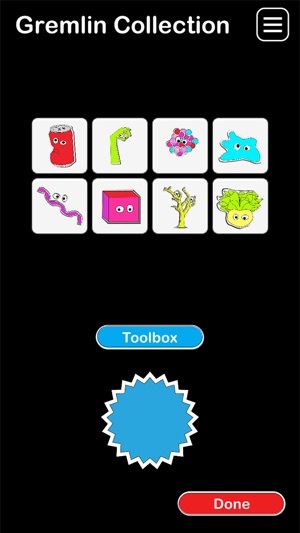 The player must choose the correct tool to catch each gremlin and tap on it to “catch” it. When a sufficient number of gremlins have been caught, the raingarden is cleared. 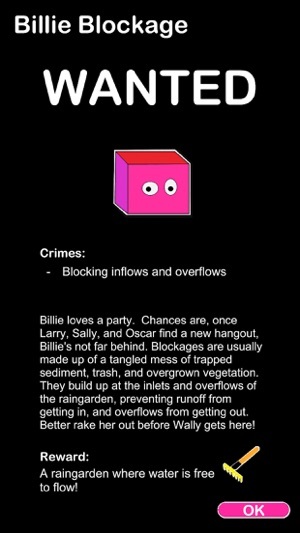 Level 1: Get to know the gremlins. Each gremlin can only be captured with the correct tool. Catching the gremlin will reveal the gremlin's Collector Card, which has more detailed information about who they are, where they come from, and how they can be defeated. Capture all of the gremlins to advance to Level 2. Level 2: Speed drills! Gremlins will start spawning one after another. Capture them all, using the correct tools, until they are all cleared. Be careful not to let too many spawn at once or the raingarden will die! Level 3: Now that you've cleared one raingarden, be a hero and clear out the whole neighborhood. Inspector Green integrates science and technology in the public space through play-based education. This game provides community stewards with a learning tool to engage in real time and space at their own pace. 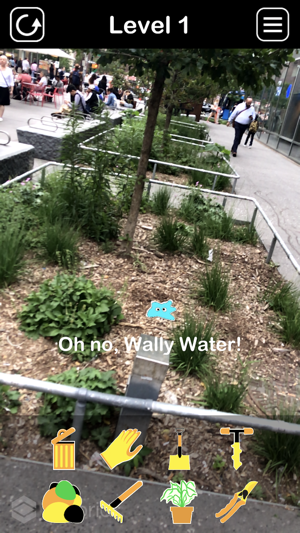 The augmented-reality scavenger hunt guides players towards an intuitive understanding of maintenance issues with bioretention. Integrating bioretention facts and maintenance needs through participant action, Inspector Green encourages learning through play. This engaging game is an innovative tool to expand the eyes-on-the-ground and broaden communication between stormwater specialist and the community. Inspector Green is targeted toward raingarden workforce trainers and trainees, the general public, educators, ecotourists, environmental advocates, gamers, smartphone users, stormwater professionals, and river advocates. The game dovetails with local efforts in the District of Columbia, including the watershed stewardship academy, and green jobs training. The app is free for download. Inspector Green was built in Washington DC, and most of the game locations are currently located here. Players outside of the DC area can use the app in Demo mode in order to test out the augmented reality game play. Contact DesignGreen, LLC for supplementary instructor slides and to add game stops anywhere in the country! 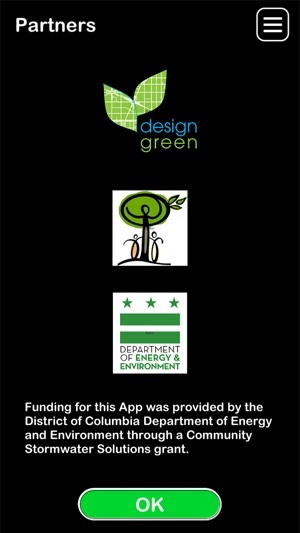 Funding for Inspector Green was provided by the District of Columbia Department of Energy and Environment through a Community Stormwater Solutions grant. Inspector Green is adding locations all the time! This update makes that process simpler and quicker for us. Watch as we spread all over Washington DC!